A View from the Porch is an illuminating collection of 22 essays about the points where design touches life and the big and small things that make us appreciate, or become disconnected from, our homes and neighbourhoods. Drawing on his experiences as an architect, planner, world traveller, and educator, Friedman delves into issues such as the North American obsession with monster homes, the impact of scale on the feeling of comfort in our communities, environmental concerns such as deforestation, innovative recycling methods in building materials, the booming do-it-yourself industry, the decline of craftsmanship, and the role of good design in bringing families together. 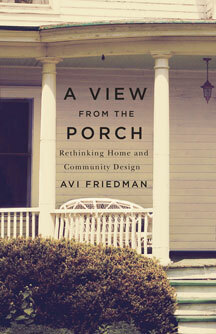 Written with Friedman’s trademark flare A View from the Porch offers a compelling vision of the influence of design in our everyday lives from one of the world’s most innovative thinkers. This is a totally revised edition, with new material, of Room for Thought published in 2005. Avi Friedman is a professor of architecture at McGill University. He is the recipient of several research and design awards including the World Habitat Award and the 2014 Sustainable Buildings Lifetime Achievement Award. He is the author of sixteen books, including Narrow Houses, A Place in Mind: The Search for Authenticity, and Innovative Houses: Concepts for Sustainable Living. He lives in Montreal, Quebec.